May 3 -Pierre Cardin, 88 and still a top name in clothes design, said he wants to sell his label while retaining artistic control, but his price of a billion euros ($1.48 billion) is five times bank valuations. Cardin, one of the first to take French fashion design labels into Asia in a big way and one of the first to develop brand licensing, told the Wall Street Journal: "I want to sell it now." The Cardin brand has put its stamp on hundreds of products from shirts to bottled water and real estate: some say too many. 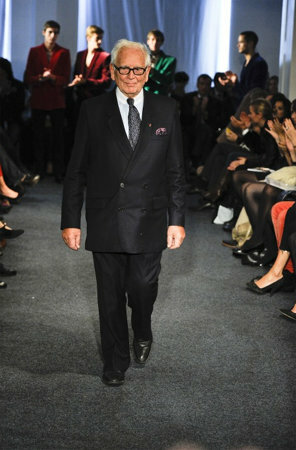 Pierre Cardin entered Asia in the 1950s, set up in Japan in 1957, and then in China in 1979. Today consumers in Asia are among the biggest customers for luxury products and designer clothes, and French luxury goods companies are global leaders. "I know I won't be here in a few years and the business needs to continue," said Cardin, who does not have an heir. But on one condition -- that he remain creative director: "It will be in the interest of the brand's reputation," he said. But Cardin is asking too much for the image of the brand and the skill of his talents, judged by hard-nosed bankers who value the business at closer to 200 million euros, just one fifth of the one billion he told the newspaper he is seeking. Financial data for calculating valuations is thin because the Cardin empire is not quoted on any stock exchange and so is not obliged by listing rules to provide detailed figures such as sales volumes. At business consultancy Savigny Partners, senior manager Pierre Mallevays said: "A brand like Cardin does not increase (in value) like a normal brand because it is entirely based on licence revenues." Valuations are reached by applying a multiplying ratio to licence income streams, he told AFP. "Financially, Pierre Cardin is a very big deal because all these licences generate a lot of royalties," he said. Cardin explained his pricing logic, on the basis of 10 million euros per product per country, "which is nothing at all", he said. "One thousand products, 100 countries, that's how it calculates. It's nothing." The group employs 450 workers but owns only one Cardin shop in France. However, it manages at least 500 licences throughout the world. Cardin was also one of the pioneers of licensing, a capital-efficient method of developing a business by selling the right to sell branded products. Cardin has since built up an eclectic range of businesses and brands, including the exclusive Maxim's restaurants, and also high-end furniture, and perfume. In 2009, Cardin sold 32 textile and accessory licences in China -- but not its brand -- to companies Jiangsheng Trading Company and Cardanro for 200 million euros. Although there are no publicised buyers for the Cardin business, US group Iconix Brand may be a bidder, a source familiar with the deal said. But top names such as groups, such as LVMH and PPR are less interested because they "want to control the brands they own. Cardin, on the other hand, gave a multitude of licences," the source added. "Pierre Cardin is a brand that was at times a little too exposed, too used, too franchised and in a way intangible assets were greatly squandered," said Laurent Habib, who heads the Paris-based Observatory on Intangibles. "The Fashion Freak Show", which opens to the public next week, traces the journey of the enfant terrible of French couture from his humble origins in a Paris suburb to international stardom.